I remember vividly the scene in The Big Short when a housing broker was driving the “Steve Eisman” group around California’s “Inland Empire.” Home prices were dropping and the vista was littered with “for sale” signs. The broker remarked awkwardly, “the market is going through small valley right now.” Successful realtors can look anyone in the eyes and present a small nuclear bomb as a box of Godiva chocolates. The National Association of Realtors’ chief “economist,” Larry Yun, has been pleading for more than a year that declining existing home sales is caused by low inventory. But this is mere propaganda. I’ve presented a chart more than once on this site from the Fed’s database (FRED) which shows that sales volume and inventory is inversely correlated. Redfin released its”Housing Demand Index” through June on August 1st. It fell nearly 1% from May and was 9.6% lower in June 2018 than 2017. The number of people requesting tours fell 6.1% compared to June 2017 and 15% fewer made offers on homes. This is despite noting that inventory levels surged in the hottest markets in which RDFN operates. This index is representative of demographic trends nationwide, as RDFN operates in the largest metropolitan areas outside of New York City. The Index covers 15 metropolitan areas. Demand is falling because pool of potential homebuyers who can qualify for one of the Government’s subprime mortgage programs has dried up like Lake Mead. This was evident in this week’s existing and new home sales reports, both of which showed home sales falling month to month and year over year. Both numbers were well below the expectations of Wall Street’s brain trust. Existing home inventory on an outright basis (not the highly massaged “months supply” basis) is 9% above the average inventory level in 2015 and 31% above the outright inventory for 2017. New home sales dropped “unexpectedly” from June to July despite the fact that June’s original headline report was revised lower. New home sales according to the Census Bureau have declined 3 out of the last 4 months. The Dow Jones Home Construction Index is down 22.6% since mid-January. Some homebuilder stocks are down over 30% since then. The homebuilder stocks are in a bear market based on the “20%” decree. This is a fact that is not reported at all in the mainstream media. The homebuilder stocks peaked in July 2005 and were in a tail-spin well before it became obvious to all that the mid-2000’s bubble had popped. I doubt it will take 18-24 months from January 2018 before it becomes apparent to most that the housing market is in trouble. My subscribers and I have been raking in easy money shorting the homebuilder stocks. I will be updating the my short ideas – including ideas for using puts – in Sunday’s issue after TOL’s numbers triggered a one-day spike up in the DJUSHB. I’ll also be updating the Tesla saga. You can learn more about this newsletter service here: Short Seller’s Journal information. This almost makes me wonder if Angelo Mozilo is running NASA Federal Credit Union. Fast closing guaranteed. If you don’t close by the contract data, NASA Federal will give you $1000 toward closing costs. Jumbo Mortgages are included in this offering. The only thing guaranteed about this product is that a large percentage of the borrowers will eventually default. With 0% down, the borrower is going to be underwater by at least 10% after all closing costs are factored into the equation. 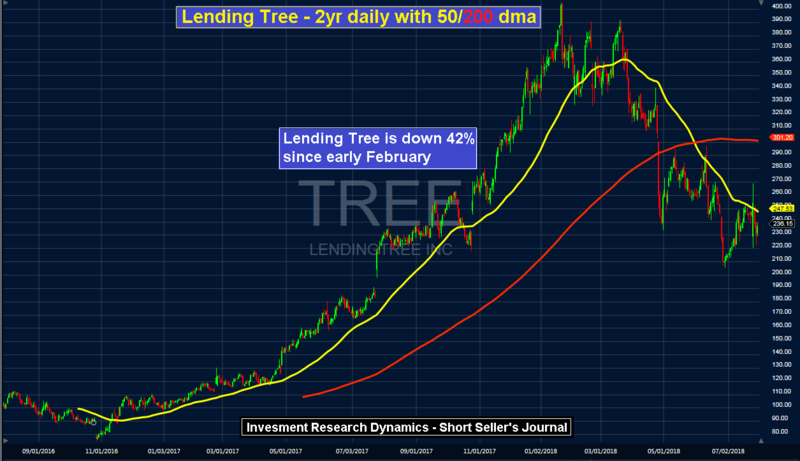 I presented Lending Tree as a short idea to my Short Seller Journal subscribers in early June at $260. In the next issue I’ll update my view on TREE and how to play it with put and call options. One subscriber emailed me yesterday to report that he shorted August $300 calls for $2.92 when I suggested the idea in June and covered them for a dime. You can learn more about this newsletter service here: Short Seller’s Journal information. Total home sales in SoCal were down over 11% year over year in June (as reported by the California Association of Realtors). With housing, as goes SoCal, so goes the rest of the nation. The homebuilders are the short seller’s gift that keeps on giving. I just released my weekly issue of the Short Seller’s Journal. In this issue I present more stunning housing market collapse data, I discuss AMZN’s latest earnings report and I talk about Steve “The Big Short” Eisman’s latest short position, which has been one of my SSJ recommendations for a several months. You can learn more about this newsletter service here: Short Seller’s Journal information.